Amidst the deluge of promotional messaging and press releases, it’s not unusual for hype to exceed, or even run contrary, to actual substance when it comes to new business terminology and jargon. That makes it all the more difficult to discover examples that live up to their monikers, and all the more inspiring when you do. Vulcan Impact Investing does that in ¨Powering Productivity.¨ an open access white paper released Oct. 19 in which it lays out the challenges it has faced and the means devised to surmount them over the past two years as it installed and operated 10 solar-powered microgrids in rural Kenya. That’s changing fast as these and other stakeholders – local community leaders and clean energy entrepreneurs notable among them – join in innovative efforts to install and support community-based off-grid solar mini- and microgrids. In it, Vulcan investigates the variety of factors that can make or break the value of a mini-grid. That includes: recruiting an appropriate customer base, generating revenue, balancing supply and demand and creating social impact. Breaking up with fossil fuels – It’s remarkable how many of our customers are willing to shift away from an energy source they’ve used their whole lives. Prior to the installation of our grids, 86% of our customers used unsafe and unhealthy kerosene, disposable batteries or diesel generators to meet their energy needs. Post-grid installation, only 4% of customers are still using any of these fossil fuels. Electricity is sparking economic development – Simply put, the arrival of power allows for entrepreneurship and opportunity, particularly for rural youth. The majority of new businesses in the villages we’ve electrified have been started by younger and tech savvy customers. We’ve learned that, as a result, more young people are staying in the villages because of this newly available job opportunity. 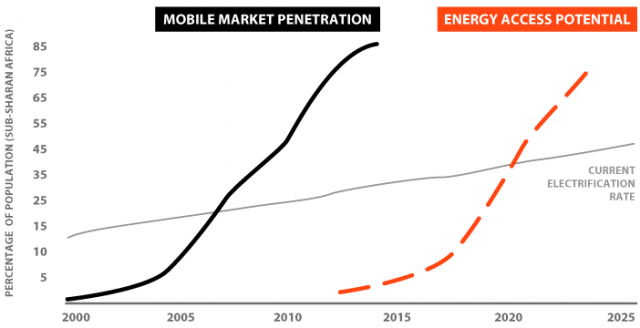 Unlocking access to energy using mobile phones – Throughout rural Kenya, consumers are accustomed to pay-as-you-go mobile services via their cell phones. Since cash flow can be an issue, if the power goes out due to lack of payment, with a quick tap on their cell phones, our customers can make instantaneous micro-payments to turn the lights back on. One-time payments can be as low as $0.10 with some customers buying electricity as often as five times per day. Turning on more than just the lights – Appliances are critical to driving electricity demand and making mini grids profitable and sustainable. Our customers tell us that they would buy more electricity if they could afford more appliances, but they often struggle to afford these refrigerators, TVs, welding machines, etc. We’re working to develop a program which will enable our users to access appliances either through a leasing or a rent-to-own program. Going off the grid and into the 21st century – At the current rate of connecting new homes to the national electricity grid, it will take more than 60 years for every African to have access to affordable, reliable, sustainable and modern energy — an UN Sustainable Development goal. Privately operated renewable energy mini grids, on the other hand, can be installed and operating in a matter of weeks. Mini grid companies — much more nimble than national governments — are providing clean and reliable to consumers. They are also making connections to electricity more affordable. The open access white paper is one way Vulcan aims to reduce risks in this fledgling but fast growing off-grid market sector, as well as inspire and inform other investors, operators and partners, the company explains. In addition, Vulcan is a partner in Power for All, an international association of 150 organizations that aims to bring modern, low or zero-emissions electricity to all rural Africans in 10 years. Off-grid solar powered mini- and microgrids are central to its plans. There’s a glaring lack of knowledge and understanding regarding exactly how aspiring mini- and microgrid investors and operators can successfully cultivate a paying consumer base in rural African markets where many are cash poor and ¨unbanked.¨ ¨Open data is a hallmark of Paul Allen’s Vulcan Inc. and this white paper, the first in a series, is aimed at growing the mini-grid development opportunity and better serving unconnected communities,¨ the press release states.